The staff was very friendly and had some great Suggestions. The apartment was beautifully furnished and had everything we needed to make simple meals. The staff had left a handwritten welcome note (with our names on it!) and a bottle of wine on the kitchen table. A very nice gesture! Friendly reception. Spacious rooms. Excellent location The shower was unbelievably therapeutic in our room !! Really comfortable room, friendly and helpful staff!!! Extremely happy customer! Lots of space. Self-contained accommodation for less price than nearby hotel rooms. great room, comfortable clean and spacious. the breakfast was an amazing surprise; the bread and pastries were fresh, it included hot breakfast and the coffee was excellent!! all the staff were very friendly and professional. Lock in a great price for Mantra on Kent – rated 8.3 by recent guests! Mantra on Kent This rating is a reflection of how the property compares to the industry standard when it comes to price, facilities and services available. It's based on a self-evaluation by the property. Use this rating to help choose your stay! Centrally located between Darling Harbor and Sydney CBD (Central Business District), Mantra on Kent offers modern self-contained apartments with a flat-screen cable TV, a DVD player and a CD player. It features a 24-hour reception. Darling Harbor is a 5-minute walk away, Sydney International Convention Center is 10 minutes' walk away and Barangaroo is 0.6 mi away. Mantra on Kent Apartments are located in the heart of Sydney, just 5 minutes’ walk from Queen Victoria Building and Pitt Street Mall. Chinatown is a 10-minute walk away. All air-conditioned apartments have a full kitchen with a microwave and refrigerator. Each apartment has a spacious seating area, and most also have laundry facilities. Some rooms offer a balcony, subject to availability. Cascades Restaurant serves breakfast every morning. Alternatively, there are a number of restaurants, cafés and bars just 5 minutes’ walk away. When would you like to stay at Mantra on Kent? This open-plan apartment features a full kitchen and a spacious dining and lounge area with a flat-screen TV and a DVD player. This room has no capacity for extra guests. Private parking is available at a location nearby (reservation is not needed) and costs AUD 55 per day. This apartment features a kitchenette and a spacious dining and lounge area with a flat-screen TV and a DVD player. This room has no capacity for extra beds or cribs. This open-plan apartment features a full kitchen, laundry and a spacious dining and lounge area with a flat-screen TV and a DVD player. Apartments with a private balcony or views of Darling Harbour are available upon request (subject to availability). This apartment features a separate living room and full kitchen and laundry facilities. Please note that this apartment is made up of an interconnecting Studio Apartment and an Executive Studio Apartment each with its own kitchen facilities. Please note that the 5th guest will be accommodated on a sofa bed. This apartment has a seating area, washing machine and microwave. This apartment features air conditioning, cable TV and microwave. This studio has air conditioning, seating area and microwave. This apartment features air conditioning, seating area and CD player. Mantra on Kent offers contemporary, stylish Sydney accommodation in the heart of the CBD. Located less than a kilometre from the city's iconic tourist and business destinations and moments away from the ICC, you'll be in the perfect base for business travelers, couples and families to explore the sights and sounds of Sydney. Wake to sweeping views of the city or harbour from your spacious apartment. Start your day with a short stroll to Sydney's entertainment hub, Darling Harbour, where you can witness the world's largest permanent interactive light display, visit Sydney Aquarium, explore local museums and marvel at the natural beauty of the Chinese Gardens. 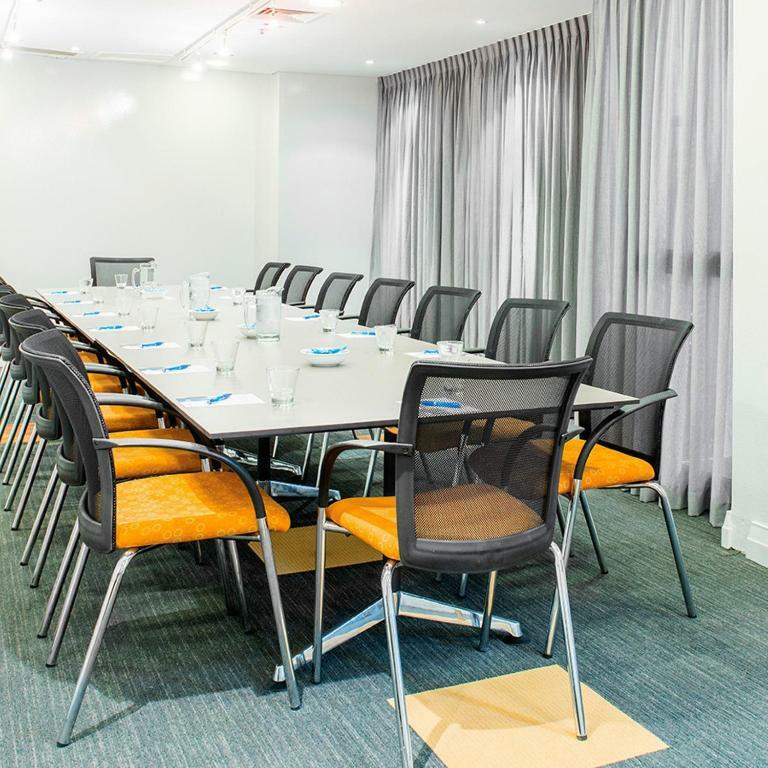 If you're in Sydney on business, we've got you covered, Mantra on Kent offers onsite business facilities including an internet lobby lounge and fully equipped meeting rooms. Internet access is provided in all apartments so you can continue working in the comfort of your room. With 24-hour reception and modern conveniences at your fingertips, Mantra on Kent is the obvious choice for inner city accommodation in Sydney. The Team at Mantra Kent aim to provide exceptional service to all guests by exceeding expectations and assisting when possible for all enquiries. Fabulous food, international fashion, an idyllic harbour and non-stop entertainment are on your doorstep at the Mantra on Kent Apartments. Just a few metres from your door is Sydney's favourite entertainment destination, Darling Harbour, where you'll find something for the whole family - Sydney Aquarium, Madame Tussauds, Powerhouse Museum, Maritime Museum and more than 60 restaurants across Harbourside, Cockle Bay and King Street Wharf. If shopping is your passion, you'll find a department store, designer shop, boutique or market just minutes from Mantra on Kent. A visit to Sydney isn't complete without a trip to the iconic Queen Victoria Building where you'll discover “the most beautiful shopping centre in the world” housing more than 200 specialty shops. Take time out to savour fine coffee, exquisite food, international wines and delicious cocktails at the many restaurants and bars that scatter the Sydney CBD. Enjoy an evening stroll and soak up the sounds and sights of one of the most beautiful cities in the world. House Rules Mantra on Kent takes special requests – add in the next step! A AUD200 damage deposit is required on arrival (around USD140.23). This deposit will be fully refunded 7 days after check-out, as long as there isn't any damage to the property. Mantra on Kent accepts these cards and reserves the right to temporarily hold an amount prior to arrival. Car parking is available next door to the property at Wilson Parking, at a charge of AUD 50 per 24-hour period and includes 1 entry and 1 exit. Please note when booking 5 or more rooms, different policies and procedures apply. A damage deposit of AUD 200 is required on arrival. That's about 140.23USD. This will be collected by credit card. You should be reimbursed within 7 days of check-out. Your deposit will be refunded in full by credit card, subject to an inspection of the property. Big room with Extra living space, kitchen and laundry. Apparently got an upgrade. Don’t think the room was as good as the one we had booked. The one bedroom apartment was small, the bedroom was tiny. We prefer a walk in shower, instead of having to hurdle the side of a large bath. The location, the friendly staff and the breakfast. Good location. Very close to Darling Harbour and also railway station. Front door very stiff when managing luggage.